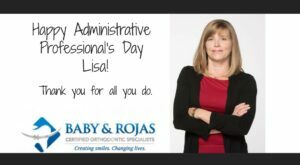 Thank you for all you do Lisa! As you may know already the New Canada's Food Guide was released. If you haven't had a chance to review it yet, you can do so here. New to Invisalign? We have a great new video for patients wearing Invisalign. In our video our team member covers attachments, order of trays, how to differentiate between trays, inserting and removing your trays, chewies and more!